The following is a list of Hymns that possibly could be used in conjunction with the 2014 celebration of the Week of Prayer For Christian Unity. It is by no means and exhaustive listing. The hymns were chosen from the hymnals of various religious denominations and the denomination is listed opposite the hymn’s title. 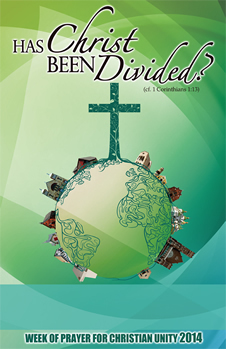 Additional resources for the Week of Prayer for Christian Unity 2014 are available on the website “Ecumenism in Canada” at the following address: http://ecumenism.net/music/ The files listed there have been submitted in response to an open call to Canadian composers to submit music on the theme of the Week of Prayer for Christian Unity 2014 (Has Christ Been Divided? 1 Cor 1:1-17) or on the general theme of prayer for Christian unity. Please download any or all of these pieces and use them in your prayer for Christian unity. All resources at this Canadian website are copyrighted by the composers, All rights are reserved. Non-exclusive, non-commercial license to download, duplicate, and perform publicly is granted for Christian communities gathered to pray for Christian Unity. The composers have given permission for their music to be copied and shared as necessary to facilitate prayer for Christian Unity. Sale or distribution of this music in any other format or context is not permitted without the express permission of the composer(s).